I have to admit that when I first heard the term “rain garden” I immediately pictured lush foliage dripping with moisture. But I was wrong. A rain garden is nothing like a rain forest. Neither is it a bog, a wetland or a pond. Rain gardens are in a class of their own. 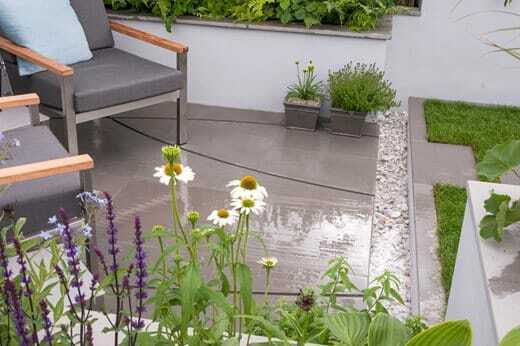 Creating a rain garden is a way of relieving pressure on drainage systems by capturing runoff and allowing it to soak into the ground – but without waterlogging the whole garden. At the same time, any pollutants that rainwater collects get filtered out by plants and soil. That way, our rivers and waterways benefit from receiving water the way nature intended. In the briefest of terms, water is collected from roofs and hard surfaces and then channelled to a well-drained part of the garden. It might take a couple of days for it to seep into the soil but it never creates a permanent pond and is not around for long enough for the water to get stagnant. It’s a fascinating and beautiful feature, suitable for almost any sized garden. This rain garden is part of a garden makeover in Ongar, Essex. Rain from a thatched roof falls onto this bed, watering the plants as it goes. When the soil reaches saturation point, excess rainwater is directed into a drainage ditch and enjoyed by local wildlife. How do you collect water for your rain garden? Water for rain gardens can be collected in a number of ways. By diverting down pipes from the roof away from the existing combined sewer and into a large planter, a rill or a pool, which in turn drain into a channel. Rhiannon Williams’ Urban Rain Garden was voted People’s choice at RHS Hampton Court in 2017. 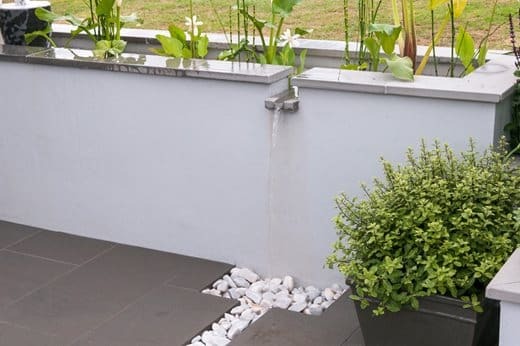 Here water from downpipes is captured in this lovely deep planter. When the planter is full, excess water overflows into a rill full of pebbles and makes its way down towards the rain garden. What happens to the water once it’s captured? The runoff water travels to your rain garden via a rill or a stream. These can be designed to suit the style of your garden. You may choose a natural looking stream bed with pebbles and rocks. Or maybe a contemporary stainless steel channel will look best in your garden. You could cover it with a grill or you could make a feature of it. Water will finish up in the actual rain garden. Your rain garden is a depression in the ground which is backfilled with well-drained soil and planted with (preferably) native species. 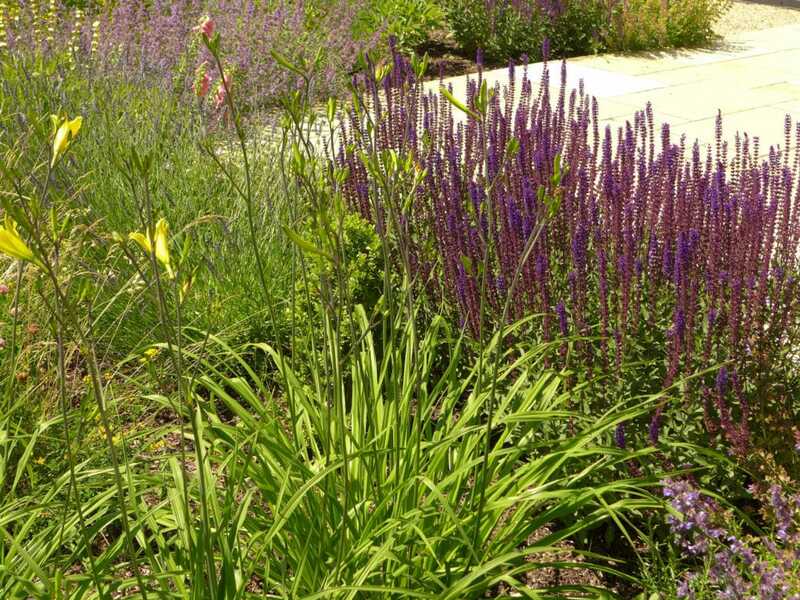 The rain garden collects all of that water and allows it to seep gently into the soil. It’s effectively a smaller version of the flood plains beside rivers. In very wet weather, you may see puddles in your rain garden. Depending on the volume and the frequency of the rain, those puddles should disappear within a few days. So some of the time your rain garden will be wet, some of the time it will be dry. With the right plants growing in it, it will be fascinating whatever the moisture levels are like. This is Rhiannon Williams’ Urban Rain Garden again. I love the water collecting grooves in the paving. Innovative AND attractive. As water journeys through your rain garden, Mother Nature works her magic on it. Plant roots and soil microbes capture pollutants like dust, oily deposits from driveways and chemicals that the raindrops have picked up from the air. Plants and soil microbes transform the nasties into harmless atoms before they can find their way into water supplies. A rain garden is a simple way of doing your bit to help the planet. How big should rain gardens be? 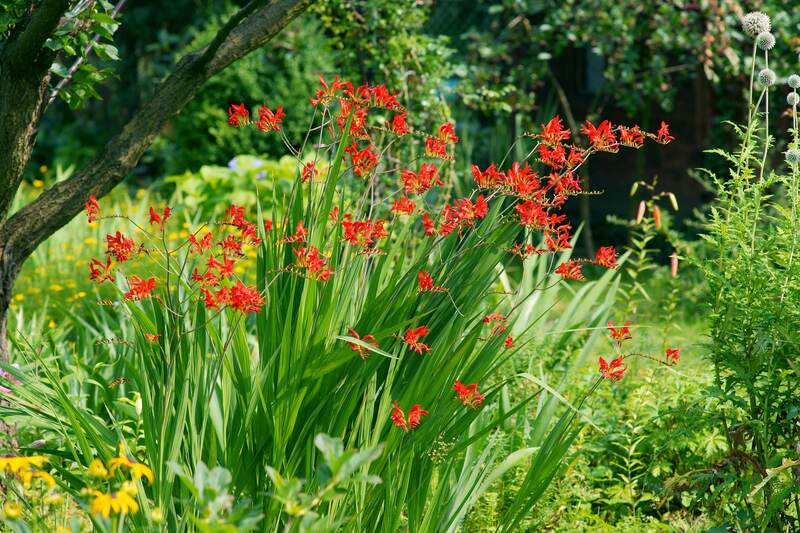 As a rule of thumb, a water garden needs to be around 20% of the area it is collecting from. So if your roof is 100m2, your driveway is 40m2 and your patio is 20m2, and you are collecting water from all 3 that’s an area of 160m2. 20% of 160 is 32. Your ideal rain garden would be 32m2. The ideal depth for a rain garden is judged by how quickly your soil drains. In a perfect world, the soil in a rain garden would drain at 1.25cm per hour. I suspect that in some of the Essex gardens that I work in, the drainage speed is much slower. Those soils would need a deeper raingarden with some aggregate added to help drainage and/or an overflow outlet for very stormy weather. The purists in ecology and garden design insist that native plants are the best for rain gardens. But personally, I think it’s good to be able to play with plants. Grasses are great in a rain garden. The root structure is great for helping to filter pollutants and they are just as happy in soggy soil as they are in dry. Rudbekia are versatile too and the golden flower heads are attractive to bees. Crocosmia are a favourite of mine and have fiery orange flowers in summer time. Lemon verbena has subtle flowers but beautifully scented foliage. There’s lots of choice out there and my colleagues at Tapestry Design Studios would be more than happy to help you with a planting plan. Building gardens that work with the weather and can adapt not only to the changing seasons, but to our changing climate is important to me. Rain gardens help sustain the wider environment, keep an outdoor space usable for most of the year and, especially on sloping gardens, can help avoid erosion. They are relatively easy to incorporate into a garden makeover. Plus there’s always something interesting going on. Whether it’s watching plants thrive or listening to water trickling through the rills. Lovely.